King University and Northeast State Community College announced a new program agreement today that will provide qualifying Northeast State students with dual admission and guaranteed acceptance to King University. King President Alexander W. Whitaker IV and Northeast State President James D. King signed the agreement during a news conference at the Wayne G. Basler Library at Northeast State. The collaboration offers students the advantage of a structured approach for completion of an associate’s degree at Northeast State, followed by the pursuit of a bachelor’s degree through enrollment at King. NE State and King University officials sign agreement for a dual admission program. Pictured from left to right are Dr. Sam Rowell (NE State VP for Academic Affairs), Mr. James D. King (NE State President), Dr. Alexander Whitaker IV (King U. President), and Dr. Matt Roberts (King U. VP for Academic Affairs). Receive a guided transition to King, culminating in a lower-cost bachelor’s degree from the University. As part of the agreement, Northeast State will accept appropriate student credits earned at King, which will be applied toward their associate’s degree. Acceptance to King will be provided as early as the beginning of the third semester of enrollment at Northeast State, and students will be able to register during King’s earliest registration event during the semester in which they will be graduating from Northeast State. For more information about the dual admission program, contact King’s Office of Admissions at 800.362.0014 or admissions@king.edu. Northeast State Community College is one of 14 colleges and universities in Tennessee to be awarded funding from the Tennessee Higher Education Commission (THEC) through the Veteran Reconnect Grant for 2018-19. The College will receive $80,000 from the grant totaling $889,277 divided among the institutions. The Veteran Reconnect grant focuses on improving the assessment of prior learning for student veterans by awarding academic credit, when applicable, based on their military training. The Northeast State Office of Veterans Affairs plans to use the grant to hire a Prior Learning Assessment (PLA) Credentials Coordinator. This person will work with academic deans and student affairs to identify academic credit markers for a student veteran’s military experience. The full Veteran Reconnect Grant supports programs and services for student veterans at campuses across the state. THEC also provide technical assistance to Veteran Reconnect campuses around prior learning assessment for veterans. Veteran Reconnect is part of Governor Bill Haslam’s Drive to 55 initiative to increase educational attainment in the state to 55 percent by the year 2025. Northeast State currently awards some specific academic credit with the remainder being applied as a military elective credit. Office of Veterans Affairs specialist John Adcox, himself a United States Army veteran, said the grant puts a student veteran on a fast track to complete a technical certificate or degree. He also noted the PLA eased the challenge veterans faced when all their military training did not translate into academic credit. The Northeast State Office of Veterans Affairs operates veterans centers on the Blountville, Johnson City, and Kingsport campuses, provides a dedicated student advisor, and hosts veterans-specific orientations. The office also sponsors professional development opportunities for faculty and staff. A chapter of the Student Veterans of America (SVA) organization was established in 2013. “This grant is an important step forward in making Northeast State one of the nation’s leading community colleges for supporting our veterans,” said Northeast State President James King. Northeast State served 179 student veterans who completed the fall 2017 semester. Kelso expects the office to serve an equal if not greater number of veterans for the upcoming fall semester. Northeast State was named a Top Ten Award Winner in the small community college category of the Military Friendly Schools ® list for 2018. The College is certified as a Veterans Education Transition Support campus by THEC. A table-top training exercise brought first responders from Northeast State and the City of Kingsport together last week at the Regional Center for Advanced Manufacturing in Kingsport. Northeast State director of Auxiliary Services, Larry Hatfield, conducted the exercise with members of Northeast State Police Department, the City of Kingsport Police and Fire departments and Central Dispatch services. Northeast State and City of Kingsport personnel discuss emergency response priorities. 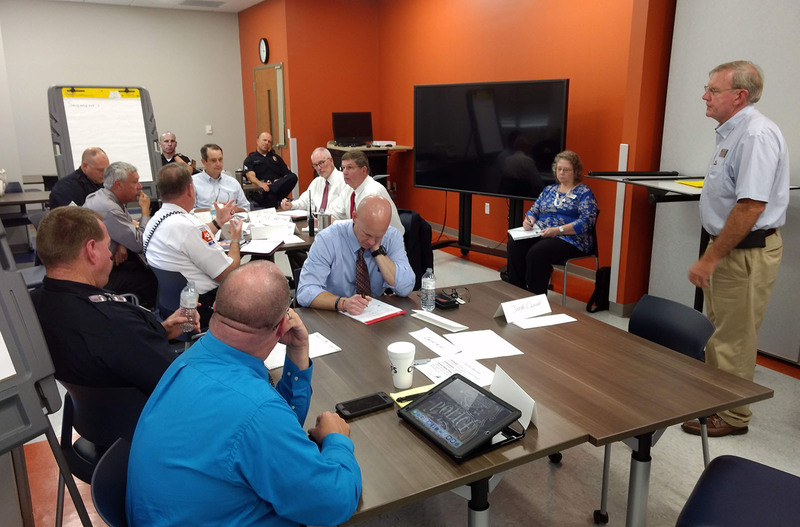 The exercise sought to improve the coordination between the various agencies, evaluate the communication process, and assess the decision-making process between Northeast State and first responders in the event of an emergency situation at a Kingsport Academic Village facility. 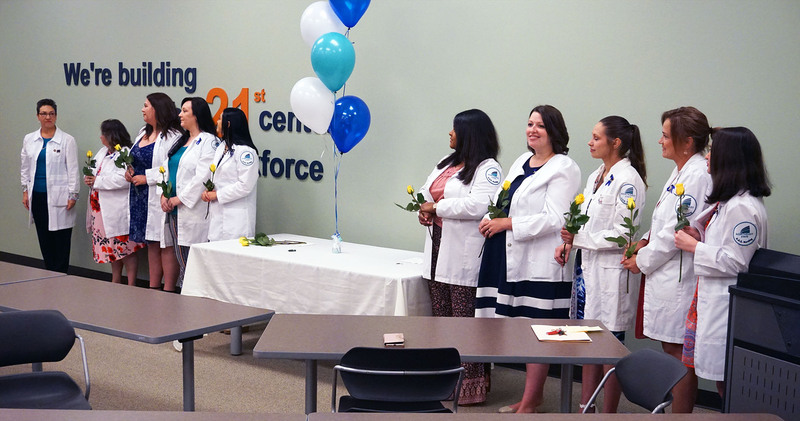 Northeast State recognized the summer graduating class of its Nursing program students at a Pinning Ceremony held on Friday at the Regional Center for Advanced Manufacturing in Kingsport. The College’s Director of Nursing, Johanna Neubrander, presented attending program graduates with a nursing pin. The Nursing graduates recognized are Jessica Coffman; Lacosta Ellis; Kayla Hawkins; Stacy Hunnicutt; Jennifer Judy; Mercedes Lampley; Krista Miller; Brooke Oliver; Sarah Phillips; and Jennifer Woods. A new group of nurses has graduated from the NE Nursing program. The nurse pinning ceremony celebrates the transition from the role of student to the role of nurse – a rite of passage into the nursing profession. It is also a symbol of care and devotion. The Nursing students honored on Friday fulfilled their degree requirements this summer. The graduates received the associate of applied science degree in Nursing from the College. 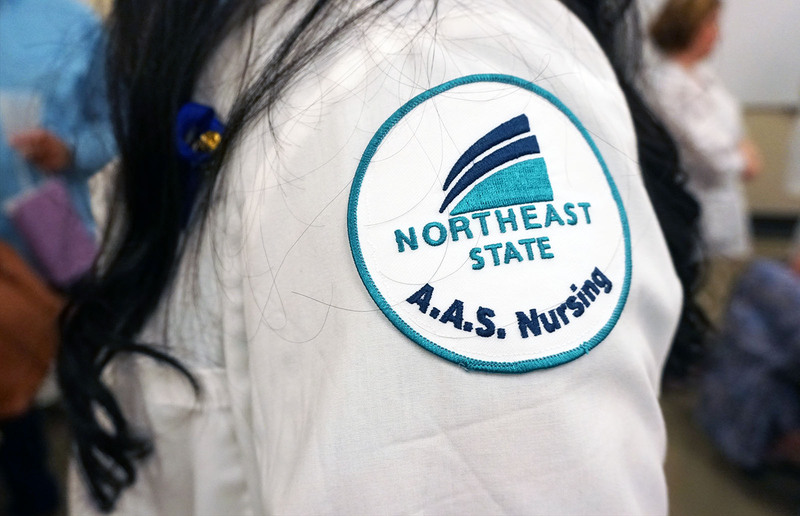 The Northeast State Nursing program marks its 10-year anniversary in 2018. Check out a few photos from today’s event at our Smug Mug webpage: https://www.northeaststatephotos.com/Nurse-Pinning-Summer-2018/. An avid hunter and fisherman Matthew Millsaps recalls a fishing trip with his father, Doug. After loading their boat out of the water near Little Wilbur Dam, they set off for home only to feel a jarring thud smack the back of their truck. Unexpected events send a shock to everyone’s system, some crueler than others. During his freshman year of high school, Matthew Millsaps was diagnosed with Acute Lymphoblastic Leukemia. Chemotherapy treatments followed. Well-wishes were sent. The difficulties mounted. A severe allergic reaction to a combination of chemotherapy treatments left Millsaps near death in an intensive care unit. Today, Millsaps has rebounded. He continues a tough fight against leukemia but refuses to let the disease take his identity. His father works full-time for Ballad Health. His mother Sharon stepped away from her job three years ago to care for her son. He talks proudly of his big sister, Sara, who attends Lee University. Millsaps also pulls no punches about the challenges he faces. Sickness, isolation, the distance from “friends” after he withdrew from public school, and the missed opportunities most teenagers take for granted. Drone XL instructor Darren Hagler (left) presents Matthew with his drone. 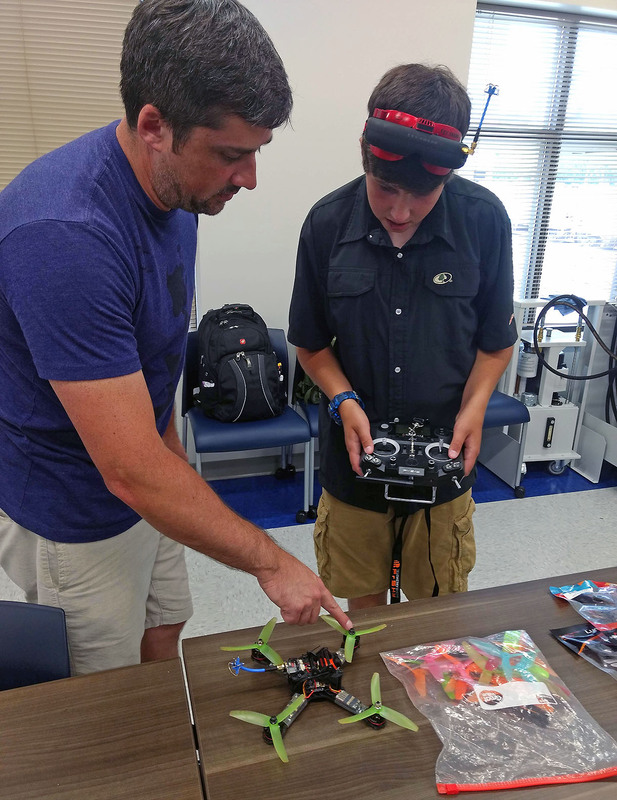 Millsaps did not miss out on the Drone XL Camp hosted at the Regional Center for Advanced Manufacturing (RCAM) from July 17th to July 20th. 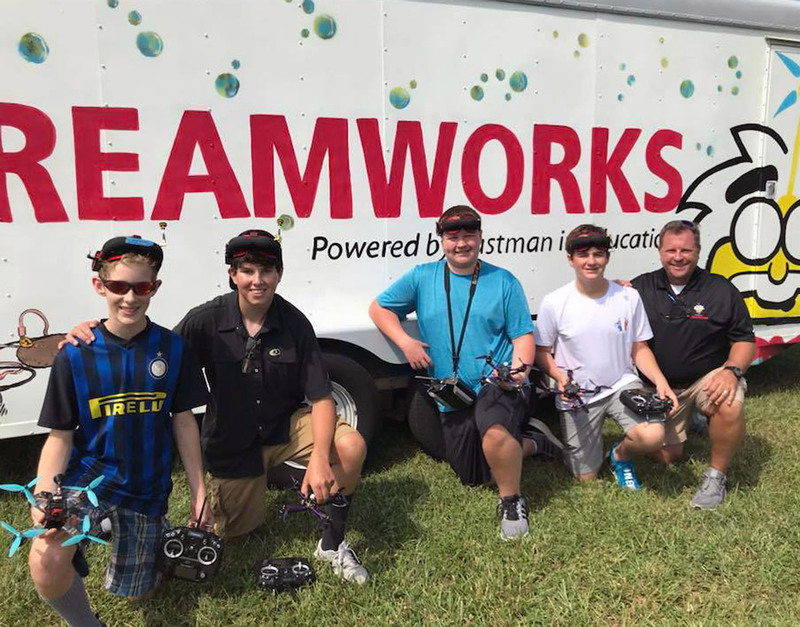 A new summer camp developed for high school and college students, Drone XL was created by STREAMWORKS, an educational program powered by Eastman to bring challenging learning opportunities to K-12 students. A generous, anonymous contributor provided the funds for the cost of the camp to ensure Millsaps could attend. Like so many young men before him, flight intrigued Millsaps. He recognized the role of aviation as a means of transportation and delivery. He started thinking about pursuing the industry as a career while in eighth grade. Homebound schooling required long hours of study whether he felt well or ill. Following a series of setbacks, it was decided to remove Matthew from public school. Sharon guided the process as her son was healthy enough to participate. Through Northeast State’s Adult Education program, Millsaps earned his high school equivalency diploma in October of 2017, and walked the stage in June of this year. Drone XL camp members learned how to control a drone’s movements, the craft’s electronic responses to controls, aerodynamics, and deftly keep a delicate yet complex piece of machinery flying, or in this case racing. In addition to learning the technical perspectives, the campers spent a significant amount of time flying a racing drone in a simulator. The Drone XL camp crew. STREAMWORKS guru Dennis Courtney and his band of science aces are determined to bring technical education to young folks looking to become tomorrow’s Elon Musk. 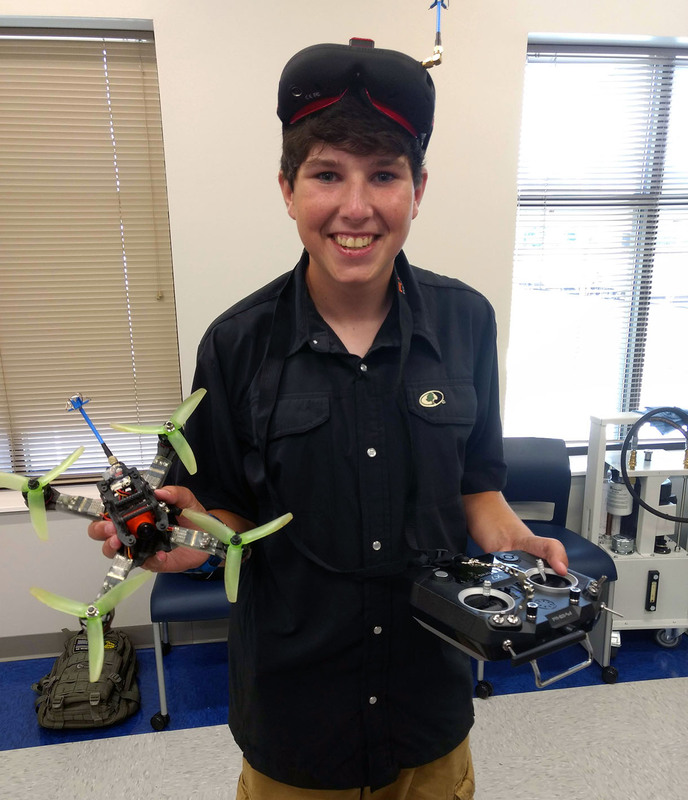 He said the camp evolved from the first drone camp STREAMWORKS held earlier this spring at Northeast State’s Regional Center for Advanced Manufacturing. “These racing drones screech through the sky at 95 miles per hour so you can imagine this is no easy feat to master,” said Courtney, executive director of STREAMWORKS. Building a drone requires patience. A series of pieces intricately placed together to balance fusing technique with technology gives flight. Drone XL challenged camp participants to build a racing drone instead of a standard drone model. Millsaps and his fellow campers took on frame design, micro-miniature electronics assembly, soldering, and even programming. Courtney noted that while the first camp was geared more towards middle school students, the STREAMWORKS team realized older high school/college age kids could build a complex drone capable of racing at high speeds. “This is significant because the skills used to build the drones are the same industry relevant skill sets needed in our 21st-century workforce,” said Courtney. Beyond any illness, Millsaps’ wide smile and eagerness to learn makes him a regular teenager exploring the world. He said his family’s faith and unity brought them through the toughest of times. A constant Millsaps has enjoyed since his youth are the hunting trips with his father. He has bagged several bucks during deer season in recent years. The camp ended with the participants marking their achievements as drone builders and navigators. Millsaps packed up his own racing drone – presented to him as a gift by Courtney and STREAMWORKS – complete with extra rotors and accessories. He hugged the instructors and his fellow campers as they said their farewells. Matthew’s chemotherapy treatments ended in July 2016, a year and a half earlier than expected, due to the multi-organ failure he experienced. He still visits the St. Jude Tri-Cities Affiliate Clinic, located in Johnson City, monthly for lab checks, and is a patient of the Gastroenterology Clinic and Heart Institute at LeBohneur Children’s Hospital in Memphis, where he visits every six months. The road ahead remains uncertain. But as Millsaps reflected on his experiences during the week, those thoughts were pushed aside. Sharon picked her son up at camp. The weekend lay ahead including casting fishing lines in the Nolichucky River with his dad. The hunter, fisherman, teenager, son, brother, and drone racer continued moving forward.